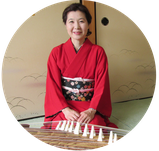 Born in Kyoto, and began to practice the piano at the age of 3. 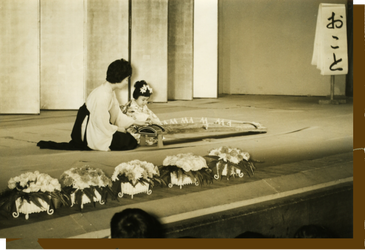 Later studied under Tadao Sawai(koto),Keiko Nosawa(20 strings koto) and　Hiroko Baba(3 stringed koto). From 1981, for two years, apprenticed to Nosaka at her house in Tokyo. Them, enrolled the Japan Music Group and played at their regular recitals. Participated in their tour to Finland, Russia, Germany, France, Korea, etc. 1982 Received diploma from NHK Japanese Music Artists Training Course. Toured overseas (America, Australia etc) with other groups and played with orchestra. and also for the Kinryokai to help her mother. Participated in concert in the Jazz Festival in New York, Stockholm, Sydney places in Germany etc. Duo of 20 stringed koto and guitar played for the Sydney Classical Guitar Society was appraised in the local newspapers. Duo concert tour of the same team is planned for May 7-middle of June in England.